For many, a bug zapper is the perfect solution when it comes to getting rid of flying insects. It has an extremely long life span, it is not hazardous to your health, and it doesn’t harm pets and children. Unlike sprays, a bug zapper, doesn’t leave behind a harmful odor or any odor for that matter. In addition, it doesn’t require that you leave the room for any amount of time to stay out of harm’s way. Unlike fly swatters or the more modern electrified tennis rackets, zappers don’t take up any of your time or energy. They are also the perfect upgrade from the old glue strips, which could be messy, leave insects suffering, and you have to endure the sound of buzzing insects that are stuck to the strips. There is also the horrible possibility that a mouse, bird or rat gets stuck to the glue strip and you then have that complication to deal with. The fact that an electric bug zapper can also be plugged in makes these available to you around the clock. Since you can just plug your zapper into the wall, you don’t have to worry about whether it will be charged when you need it, and you don’t have to continuously spend money on batteries. It’s never inconvenient to have a bug zapper around. It doesn’t generate warmth, so it won’t raise the temperature when used indoors,It is quite an affordable investment Resolution. It comes in a dark color, usually black, so you don’t have to worry about your zapper clashing with your decor. With the different types of hassle and worry-free bug zappers on the market, there is one to suit every need and budget. 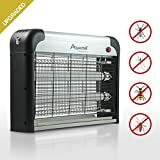 Although this particular model was made more powerful and durable for outdoor use, this bug zapper is safe to be used both indoors and outdoors, and it kills all types of insects, including flies, mosquitoes, gnats and other annoying flying insects. It’s powerful enough to attract insects within a wide radius and then demolish them, and it will do so for 8,000 hours. It comes with a one-year warranty, and it functions easily enough so that anyone can operate it. The ABS material this zapper is made with insures that it’s durable and also gives it a great look. With its 25-watt ultraviolet tube bulb, which is designed to attract flying insects, this zapper can be depended upon to work at full power throughout its manufacturer-given lifespan. After the tube bulb runs out, all you have to do is buy another one, and you’re set for another 8,000 hours. The bulb is easy to replace. This is a free-standing unit, which can be placed on the floor, the ground or elevated surfaces. It also has a sturdy hook, so you can hang it up anywhere you like. No batteries are necessary with this zapper because it comes with a power cord attached. The cord is 70 inches long, so there is no limit to where you can place it, and there is no on and off switch; all you have to do is plug it in. This operates on a 16-watt current. The powerful blue light on this device attracts insects, and the high-voltage metal grids electrocute them. The grids are made of high-quality metal, which won’t rust, crack or disintegrate. The metal grids have 1,000 to 1,200 volts of electricity at all times, so insects will be zapped as soon as they come into contact with any part of them. Insects immediately fall after coming into contact with the grids and do not get stuck to the metal, bulb or housing. The base of this zapper can be removed so that the dead insects gathered at the bottom can be discarded. There are no fumes, smoke or sound from the insects when they are zapped. There is a protective plastic housing around this insect killer zapper so that if pets or children accidentally come into contact with it they are not electrocuted or burned. This casing or housing does not prevent the intended insects from flying through the spaces and coming into contact with the metal grids; this includes larger insects such as moths. This bug zapper from H&R Micro Tech is portable and waterproof, so it isn’t affected by a little bit of water or rain, and it can be used both indoors and outdoors. This shouldn’t be used in barns, or places where there are flammable liquids, particles or fumes. Do not try to touch the inside of this lamp with your hands or a metal object as there is a risk of electric shock. If your unit needs to be serviced, have it done by the manufacturers or a professional electrician. This should be setup or suspended out of the reach of children. A safe height is at least two meters off the ground. Before use, make sure you have the correct frequency and voltage so that this appliance works correctly. This will also ensure that it isn’t damaged and that its lifespan isn’t shortened. You can leave this on non-stop without any fear of it overheating or malfunctioning. You should not operate this outside in the rain. The Outdoor & Indoor Insect Killer Zapper from H&R Micro Tech is black, weighs two pounds, is about 5.33 inches wide and 7.28 inches wide at the base. It is almost 15.55 inches tall and has a one-year warranty. It comes with one 25-Watt ultra-violet tube bulb already installed. With over 30 ratings, this product received four and a half out of five stars. Pretty much everyone was pleased with how well this zapper worked. A few customers said it didn’t turn on, and the seller offered a replacement. There were a couple of users who said that no insects were zapped, but this could be because there just weren’t any around. It can only be used indoors; though many use it on screened off porches or patios or when it’s not raining. It can always be used indoors even in extremely humid conditions. Insects will stick to the grid, so every once in a while you will have to turn the unit off, wait until it cools, and brush the grid off. There is a removable, washable tray attached to the base of the zapper. At any time, this tray can be taken out so that the insects can be discarded and the tray can be washed. The UV bulbs in this zapper glow brighter than some other models, so you might find it harder to use when you want a darker environment, such as at nighttime when you want to sleep. This zapper uses two 10-watt UV lights, which insects just can’t resist. The lights deceptively attract flying insects, and then as soon as they come into contact with the powerful electric grid, they are exterminated. At only three feet long, some complain that the cord is too short. 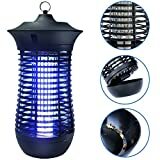 The Aspectek Bug Zapper Indoor Insect Killer draws in flies, mosquitoes, wasps and other flying insects and instantly kills them. This rectangular bug zapper sits on the floor and attracts insects from 6000 feet out. This works without the use of chemicals, and there are no harmful or disturbing odors or smoke, so it is safe to use around food, in kitchens and where there are people or pets. This can be used in most indoor areas, such as homes, offices, hospitals, enclosed garages, restaurants and schools. The active parts of this zapper- the UV lights and the electric grid are housed in a protective durable plastic so that humans and pets are not accidentally electrocuted. This can be set up anywhere on a flat surface, but it should be placed out of the reach of children and pets because with a little persistence, the protective plastic can be shifted and the shocking grids will be exposed. Also, this unit is a bit of a fire hazard if it comes into contact with something flammable. The zapper has a sturdy base and doesn’t require any type of installation. It also has a secured wire chain attached to it so you can hang it up. Having two UV lights instead of one increases this zapper’s scope. The zapper may be more effective if surrounding lights are turned off for a few minutes. This way insects will fly to it instead of regular lights. The Aspectek Bug Zapper Indoor Insect Killer does have an on and off switch. It has a power cord too and doesn’t use batteries or require charging. The bulbs can be replaced with Aspecteck ultraviolet bulbs available at Sears.com or directly from Aspectek. Running non-stop, the bulbs should last about two weeks. There are three models of this product, 20W, 30W, and 40W. 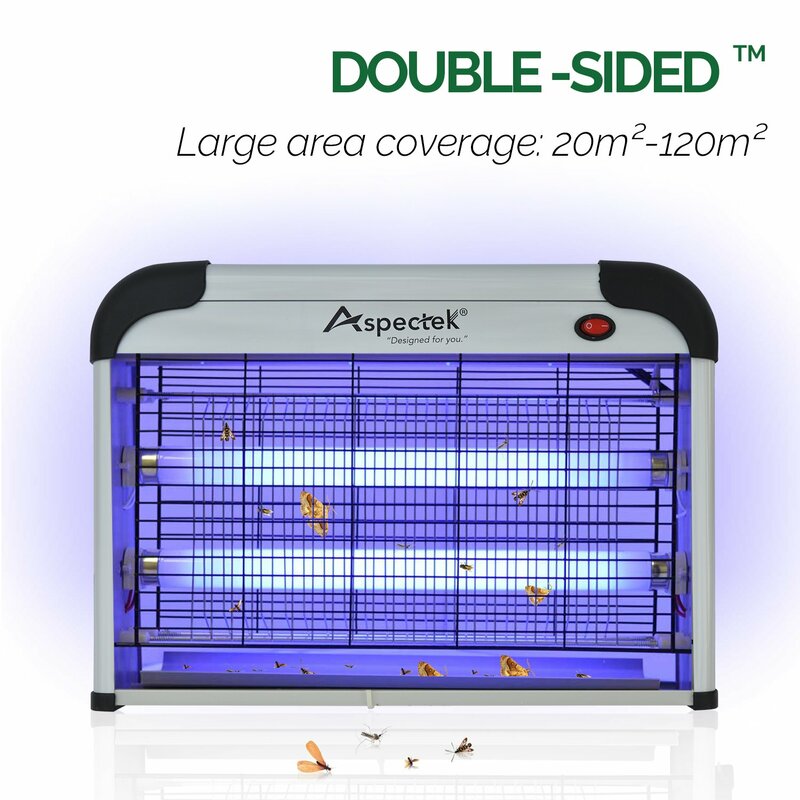 The 20W Aspectek bug zapper is 15 inches long, 11 inches tall and 3.2 inches thick and weighs 3.5 pounds. The 40W Aspectek bug zapper is 25 inches long, 12.5 inches tall and 3.2 inches thick and weighs 5.7 pounds. This comes with a one-year warranty from the manufacturer. Out of over 2000 ratings, this got an average of 4.3 stars. 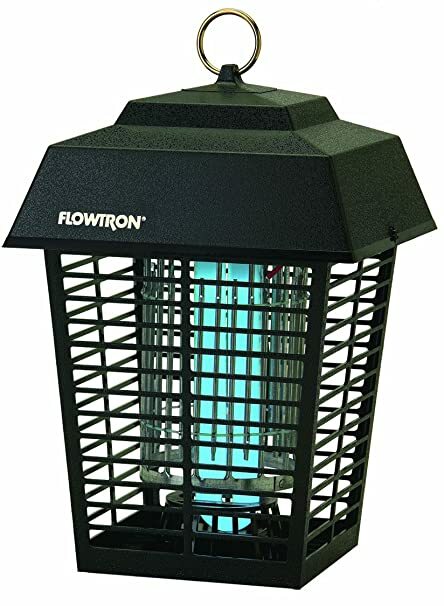 The Flowtron electronic insect killer is a powerful bug zapper for outdoor use only. Pros: Quite aesthetic in appearance. It looks like a lamppost lamp. It is dangerously powerful, and thus specifically for outdoor use. This is also virtually maintenance-free. Cons: It can only be used 25 feet or more away from human activity. It can’t be hung from a house, porch, patio or similar structure. Since it can’t be hung from the usual structures, you may have to put a little more time into figuring out how to hang this bug zapper. However, you could always just place it on a flat surface. The cord is quite short, so you may need to use an extension cord with this device. The manufacturers did a good job with this product. In addition to making it an effective bug zapper for a concentrated purpose, it looks just like a lamp and can in fact double as a security lamp. The zapper is constructed of strong polycarbonate, so it won’t crack, rust or fade, and it’s weatherproof. 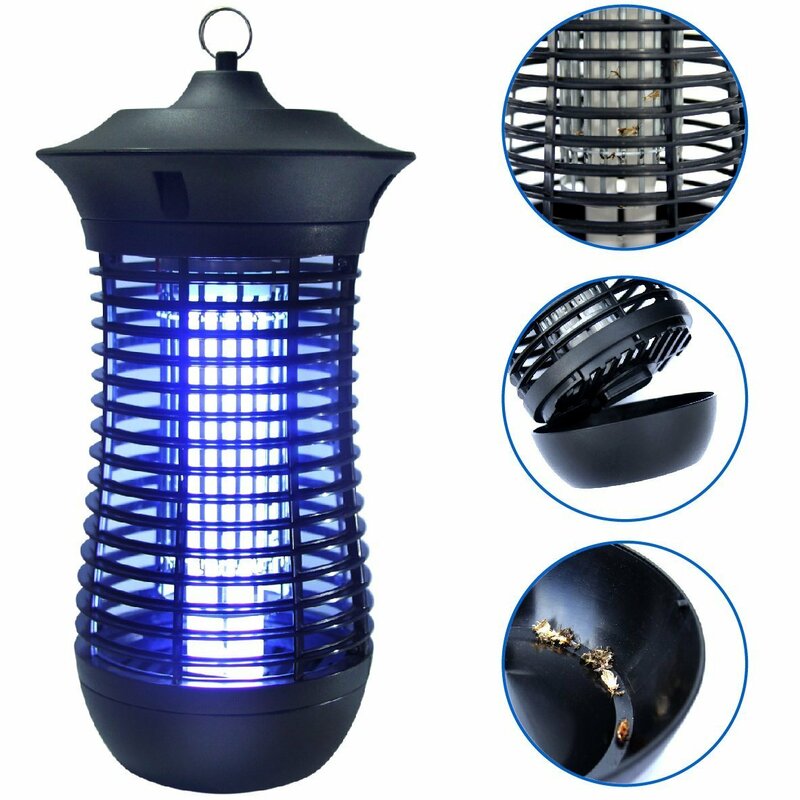 This outdoor insect zapper is designed to attract mosquitoes up to 1/2 acre away. This comes with a strong hook attached to it so you can hang it up. It also has a sturdy base and can be placed on a flat surface. Flowtron also sells a security bracket, which you can install and then hang the bug-zapping lamp from that. You can also buy Flowtron’s patented security pole specifically for use with this zapper. This way, it will look exactly like a lamp mounted on a lamppost. There is a protective caging around this zapper to prevent people, pets, birds and other animals from being harmed from the electric current that runs through the metal grids. Insects have no problem getting through the protective caging, and being zapped by the electrified metallic grids. The insects won’t stick to the grids and clog it. The Flowtron bug zapper comes with one 30-day Octenol attractant cartridge proven to attract mosquitoes and other insects. Refill Flowtron octenol mosquito repellent cartridges can be bought for this device. These cartridges attract mosquitoes to the lamp. The cartridges also attract flies, and one cartridge works for three months. However, manufacturers suggest the cartridge be replaced every 30 days for the best results. The ingredients in the cartridges only attract insects and do not harm them or make them toxic, so there is no need to worry that fallen insects will in someway be unsafe for the ground, environment and any surround plants, pets or animals. Since this was specifically designed for outdoor use, there is no collection tray. Zapped insects fall directly to the ground. This operates on one bulb, which is a 15-watt, high intensity, ultraviolet, black light, bulb #BF-35. Running it about eight hours a day, this bulb will last for about 12 months. You can buy replacement bulbs. This lantern is 8-1/2″ long, 8-1/2″ wide and x 13-1/2″ high. The Flowtron BK-15D Electronic Insect Killer comes with a two-year limited warranty. This sleek mosquito and bug killer from EasyGoProducts is the low budget and miniature version of our top picks, but it still has a lot to offer. Weighing only 2.4 pounds you can use it both indoors and outdoors where it doubles as a security light. The EasyGo zapper offers a lot with its 18-watt UV bulb promising 8,000 hours of attracting flying insects within a 1/2 acre scope. The bulb can be replaced once it does blow it. Even during daylight, the UV light will attract insects. At night the light is soft enough that it could double as a night light in a hallway. This miniature version of some of the more heavy duty insect zappers still packs a powerful punch. Upon contact with the electric grid surrounding the UV light, insects will be killed. This is a pretty silent model, and not much noise is produced when insects get zapped. Though highly effective, a little maintenance is needed with this product. The killing grid will sometimes get clogged up with insects, and you will have to turn it off and clean it out with a gentle brush or cotton swabs. However, there is no smoke build up. The catch tray at the base of the zapper catches dead insects to minimize mess around the zapper, and it can be removed, emptied of dead insects and washed as needed. This lamp doesn’t release any toxins and no chemicals are necessary for it to work. The electrocuting grid is made from durable aluminum and won’t rust. To operate this lamp zapper, just plug it into a standard outlet; no batteries or charging necessary. The cord comes in a generous length of 6 and a half feet. No installation is necessary with this bug zapper. You can place it on a sturdy flat surface or hang it up. There is a hook sturdily attached to it at the top if you decide to hang it, and a chain is also included. Due to its light weight, if using it outside, it’s best to hang it up if there is a possibility that it will be blown over by strong winds. Comes with a one-year warranty from EasyGo products. This comes in a sleek black color. This bug zapper weighs two pounds and is 7 inches wide, 7 inches thick and 13 inches long. With 20 customer ratings, this got an average of 4 and 1/2 stars. As you can see, the products each have different features, and while it’s important to get the strongest one for your environment, it’s also important to make sure you have enough electricity to operate the device you choose. Consider getting one with a lower voltage if the higher voltage zapper doesn’t fit your electric supply. Otherwise, the zapper will break or you will have to continuously turn the power back on in your house. A catch tray is a nice feature to have, especially for a zapper you will be using indoors. A catch tray just makes your life that much easier. Outdoors, it’s not as necessary. However, a catch tray is great if you want a bit of extra fertilizer for your flower bed. Just empty the contents of the tray into your flower bed. There are no chemicals involved, so you don’t have to worry about harm coming to your garden. The size of the spaces in the housing covering the metal, electric grids and how close the housing is to the grids partly determine the types of insects that will get zapped. This aspect of the housing is something to consider if you live in a place where there are insects beneficial to the environment, such as bees. On the other hand, this also determines whether or not the zapper will get clogged. The UV light is the only thing that attracts insects to the zapper, and it works quite well. Octenol mosquito attractant cartridges also attract mosquitoes, and they may increase the amount of mosquitoes attracted to your zapper. Besides high concentrations possibly being nauseating, Octenol poses no real hazards. The warranty length on the zapper you choose is important because it becomes a hassle-free appliance that you don’t have to put too much time and energy into. This also ensures that you are not constantly spending money on a zapper. Your zapper should have at least a one-year warranty. There are some with a two-year warranty, and with proper use and maintenance, they may last much longer. We have tried our best to put ourselves in the shoes of the consumer and thus have tried to include a range of bug zappers here that will meet anyone’s needs. Now it’s up to you, based on your budget, to answer the question, “If I was buying this, what would I look for, and what would be most important?” Happy shopping.